Never stop playing with Duracell batteries! Did you know that a preschooler's risk of obesity increases by 6% for every hour spent in front of the TV every day and up to 31% if the TV is in their bedroom? Have you ever thought that an average adult speaks 941 words an hour and that this diminishes to 50 when a TV is on? 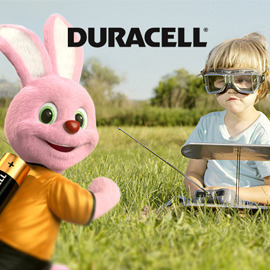 Duracell believes that playing with toys is what makes children and the whole family active and healthy. It also allows us to express ourselves and socialize with others. Duracell believes that we shall never stop playing! Playing is wonderful. The whole family should stop staring at screens and take notice. Create a “social” video that shows how Duracell batteries enable kids to be active longer and have more fun, while dramatizing the amazing longevity of Duracell in toys. Videos or animation, between 45 seconds and 3 minutes. Click here to read the full brief and to participate! Duracell will award 5 best videos! Send us your fun and surprising videos before 04th of May! Good luck! Thursday winners: Toys with Duracell and Mobile Data Sharing Plan!